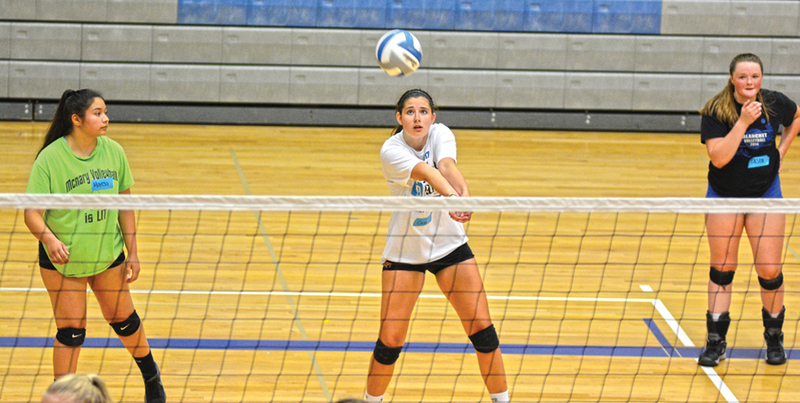 Crystal DeMello’s first volleyball camp at McNary didn’t look like a program in transition with its third head coach in three years as more than 50 high school girls packed the gym floor. “It’s exciting to see the girls ready to join a program and have the seniors lead a program,” DeMello said. DeMello noted the participation has been strong all summer as 30 girls consistently attended open gyms twice a week through July. They used the workouts to get to know each other. DeMello has been impressed by what she’s seen. “They’re a great group of girls,” DeMello said. “They are coachable. They are inspiring. They push each other to the next level and that’s something that has to do with their own competitive drive. The Aug. 7-9 camp gave DeMello the chance to go back to fundamentals and get players ready for tryouts, beginning Aug. 14. “Right before tryouts I like to break it all back down again and make sure that we’re all on the same page, keep it simple, get tons and tons of reps,” DeMello said. That’s particularly important for freshmen. “Sometimes it’s the first time that they’ve tried out so walking into tryouts they know what to expect, calm the nerves and make sure they’re set up for their best presentation for tryouts,” DeMello said.